PANDUIT is a world leader providing high quality cable management solutions for telecommunications equipment rooms, data centers and premise wiring applications. As the demand for system performance increases, it becomes essential to protect and manage cables to maintain system reliability and scalability. PANDUIT continues to provide innovative products that create the ultimate solution for managing, protecting and showcasing your network for the lowest cost of ownership. Modular design and compatibility with all PAN-NET products provides an aesthetically pleasing solution and the flexibility to facilitate system upgrades now and in the future. PANDUIT provides all the options necessary to support the most demanding copper and fiber installations. PATCHRUNNER Vertical Cable Management Rack System manages high density network equipment and patch panels in up to half the number of racks required by traditional cable management systems. 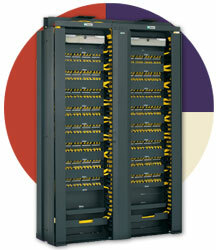 Reduce real estate costs with innovative patented angled modular patch panels and space saving vertical cable managers. These products work together to provide up to quadruple the density, reducing costs in data centers and telecommunications rooms. Bend radius fingers on vertical cable managers eliminate the need for horizontal cable managers Ensure network reliability with a complete solution that protects cables from strain, maintains data integrity, and delivers reliable network performance. 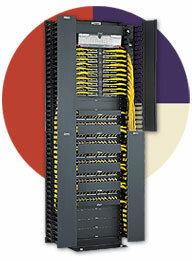 Achieve flexible system design with angled modular patch panels and adaptable vertical cable managers. To illustrate the type of savings that can be achieved in a 960-port application, a comparison of a traditional vs. high-density cable management solution demonstrates a more efficient use of space and the cost savings realized. NETRUNNER Vertical Cable Management Rack System provides a medium density solution that manages, protects, and showcases network cabling in telecommunication rooms and data centers. NETFRAME Cable Management Rack System supports heavy-duty applications utilizing an extra wide channel design to provide vertical pathways for convenient routing of cables within the frame footprint. 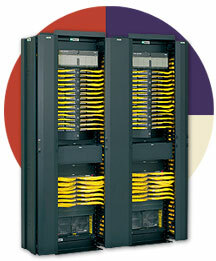 4 Post Rack System supports deep networking equipment. 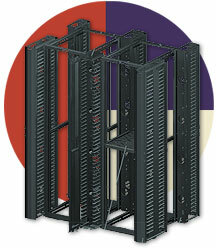 The rack combines the stability of a cabinet with the accessibility of an open rack to provide maximum flexibility.